F.O.R. Maricopa Executive Director Wendy Webb talks with Adam Wolfe about activities at the food bank. F.O.R. 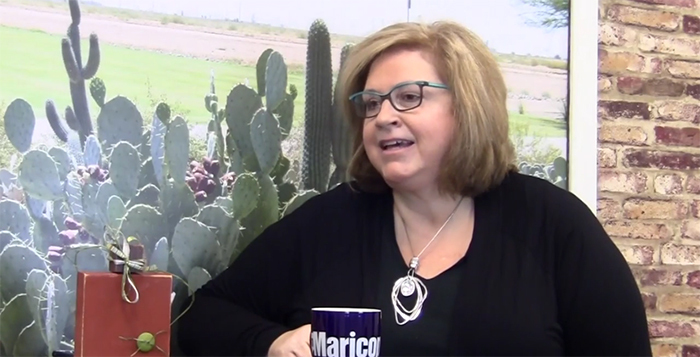 Maricopa Food Bank Executive Director Wendy Webb stopped by our InMaricopa Studio to discuss what the food bank is doing to help local families in need and how community members can get involved. Each year, the F.O.R. Maricopa Food Banks collects as many food donations as they can to provide local families with a Thanksgiving meal. This year, F.O.R. Maricopa will have enough food to provide 450 families with turkeys and side dishes. The food bank will be passing out the meal boxes from noon to 2 p.m. on Tuesday, Nov. 24, at the F.O.R. Maricopa Food Bank at 44625 W. Garvey Ave.
For more information on the food bank, or to volunteer, call (520) 251-0226 or visit www.formaricopa.org.